When I was younger, Mom used to make this amazing baked chicken. She used chicken parts, breast, legs and thighs, all on the bone. She'd bake it with just a bit of olive oil, garlic, parsley and seasonings. It was always delicious, simple and quick. 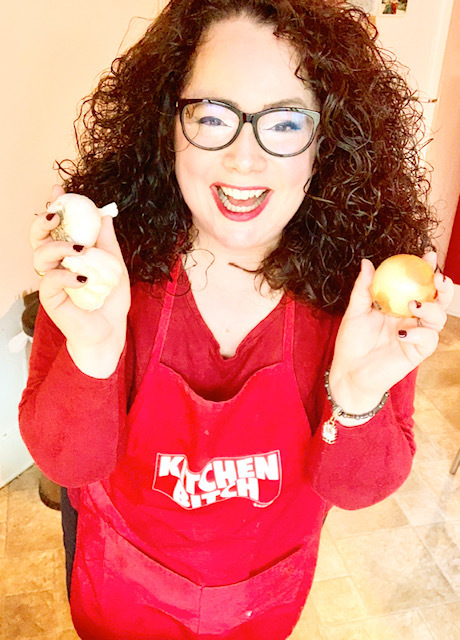 When I started making her recipe, I decided to play with it a little, being inspired by both my mother and my favorite restaurant who used to serve chicken scarpariello. 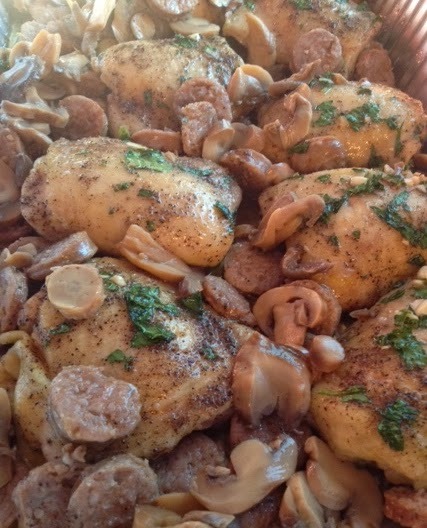 It's baked chicken parts that have slices of sausage and mushrooms on it. The flavor was an intense, rich delicacy. I couldn't figure it out. So on my own, I decided to play with this mix of two recipes and see how it would come out. But first thing's first: appetizers! 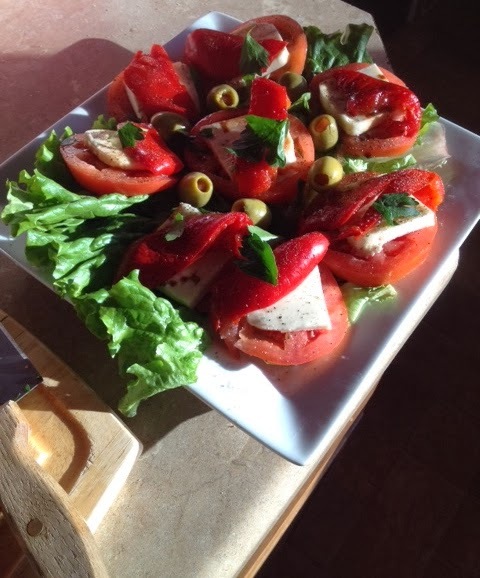 I always order an appetizer at my favorite restaurant, usually a caprese salad, which is just tomatoes, mozzarella cheese and some roasted red peppers on a bed of lettuce. You can throw in a few olives or make it with some very thin slices of onion. The only thing I use for dressing is a bit of olive oil, balsamic vinegar and salt, pepper and a touch of garlic powder. I always throw in fresh parsley leaves and basil for extra flavor and a nice garnish. There's really no wrong way to make this. It's a great way to fill up a bit while you're waiting for the chicken to finish up in the oven. The secret to my chicken lies within washing them thoroughly. Many people are now just taking them out of the package and throwing them into a pan. Don't. Trust me. Clean your chicken pieces on a light faucet flow to avoid splashing. Remember, after you clean the chicken and place them one by one into the pan, WASH EVERYTHING. We're talking the drain, the sink, the faucets, the countertops and refrigerator handles, just in case. There is a huge difference in flavor when you wash your chicken. I've noticed it as well as others. Some probably don't notice. This is up to you. First, poke holes in your chicken parts. I only use chicken thighs. They're our favorite. I give it a dry rub of seasonings first: salt, pepper, garlic powder. I then take a spoon and give each piece a nice glaze of this beautiful potion. After each piece has enough, I then throw the rest into the pan to let the meat cook into its juices. Preheat the oven to 365 (that's my magic number for perfectly cooked chicken). 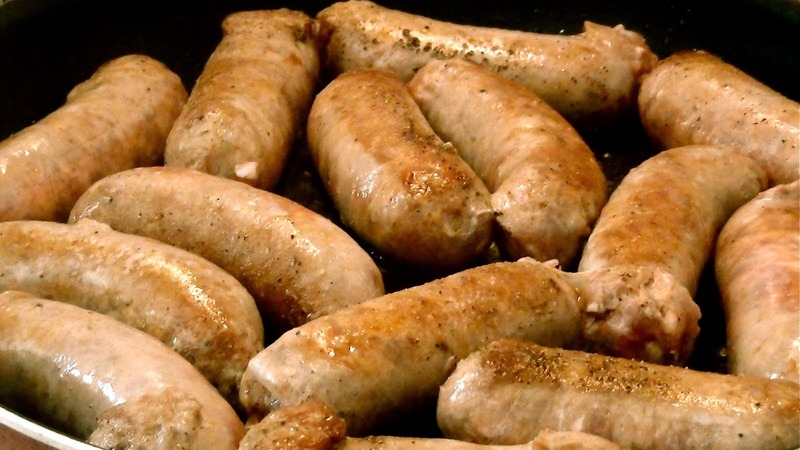 As you're baking your chicken, take a big pan out and fry up 6 sweet Italian sausages. (Has to be sweet Italian or the flavor will be totally different.) Slow cook them - do not burn these! Make sure that they have a touch of pink inside when you're done because they're going to be thrown into the oven anyway. Slice each sausage into small medallions. Place back into the pan just to cook the pieces a bit more. Chop up your mushrooms, or if they are already pre-chopped, marry the sausage and mushrooms with your chicken and distribute them evenly. It should only take an hour and 45 minutes for perfection. When one hour passes by, flip the chicken over so the bottom can cook too. Then switch it up in 30 minutes and put the oven up at 375. At the last 15 minutes, crank that sucker up to a high broil at 500 degrees for a crispy outer layer. I usually serve this with broccoli, sweet potatoes and I pair this up beautiful with a nice chardonnay. I found an inexpensive chardonnay called Domino that I really enjoy! 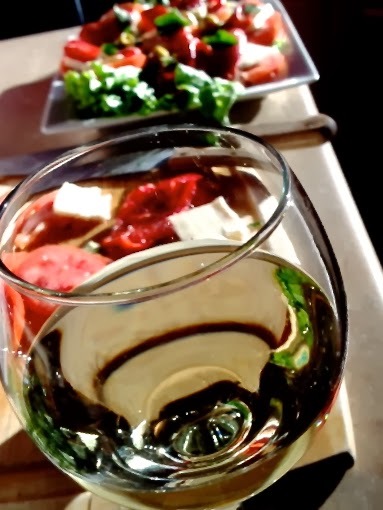 It's not about the price, it's about your palate.